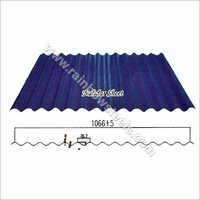 Our company, Rainbow Steel has successfully maintained its position as a reliable manufacturer, supplier and exporter of Nalidar Sheet. These sheets have a zigzag design to allow quick and easy drainage of rain water. The offered sheets are manufactured by using certified-grade materials to ensure their extended life. Our Nalidar Sheet are corrosion free, and form no holes or cracks in their body even after very long use. Copyright © 2019-20 by Rainbow Steel All Rights Reserved.